When I was a kid on vacation with my parents, my favourite thing to do at dinner was page through the cocktails menu and look at all the fancy drinks. For some reason, back in the late 70s and early 80s the menus always featured photos of the drink in question. I found the pink, yellow and blue drinks beautiful and fascinating — what did they taste like, I wondered. There was typically only one blue drink, the Blue Hawaiian, tempting because of its colour and name. So, imagine my excitement when our all-inclusive resort in Mexico featured not one but two blue drinks on the menu! Of course, I had to try them. First, the Blue Tequilini (basically a blue margarita), and then a Blue Waterfall. 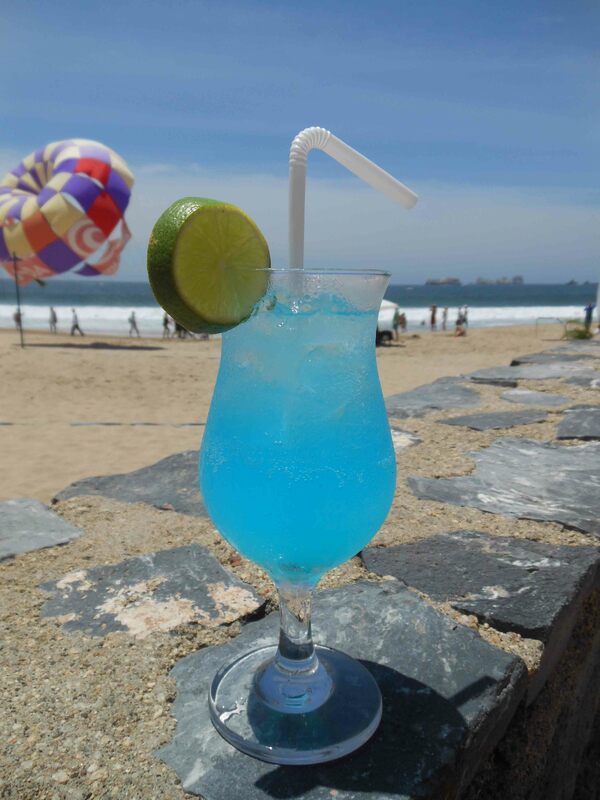 It doesn't really matter what's in it as long as it's blue, thirst-quenching and served at the swimup bar. The drink, basically a vodka lemonade with a splash of blue curacao (an orange liqueur turned blue thanks to food colouring), isn’t amazing. But it’s refreshing, sweet and most importantly, it’s blue. And nothing says “I’m on holidays somewhere warm with palm trees” quite like a blue cocktail. Build the drink over ice in a hurricane glass, stir, garnish with a lime wedge and serve with a straw. *To make simple syrup, combine equal parts sugar and water and heat until sugar is dissolved, then cool and refrigerate. This entry was posted in Cocktails and tagged blue cocktails, blue waterfall. Bookmark the permalink.